The most prestigious golf tournament of the year is finally here and with it comes the real core of the PGA season. Tiger Woods is back playing some great golf and he’s one of the favourites heading into this years Masters. The fact that Tiger is back will bring even more media attention to this massive event and I’m expecting a lot of betting interest for this years tournament. Rory McIlroy is the current favourite heading into the Masters coming off his big win at The Players Championship a few weeks back. Rory has odds of 7.50, and Dustin Johnson at 9/1 is the other main favourite before a big group of top golfers such as Rose, Thomas, Woods, Rahm, Fowler, Koepka, Spieth, Day and DeChambeau all with odds of 20/1 or shorter. The Masters always brings out new online sports bettors so this year I wanted to create a guide for Canadians looking to place their first online bets on the 2019 Masters tournament. I’ve broken down the step by step guide to setting up and online betting account and placing your Masters bets below. The first thing you will need to do is open an online betting account. I recommend SportsInteraction.com, our top rated sportsbook for Canadians. We have an exclusive deal with them where all new Canadian sign ups receive a 100% up to $200 welcome bonus on your first deposit. Here’s a full review. Click here to visit SportsInteraction.com. Now that you’ve opened your account you’ll have to make a deposit in order to have some money online with which to wager. I always suggest depositing at least $200 so that you take full advantage of the our exclusive bonus offering. You can read more about the bonus conditions on the SIA review page. If you need more information about how to place a deposit at Sports Interaction check out our deposit options page. 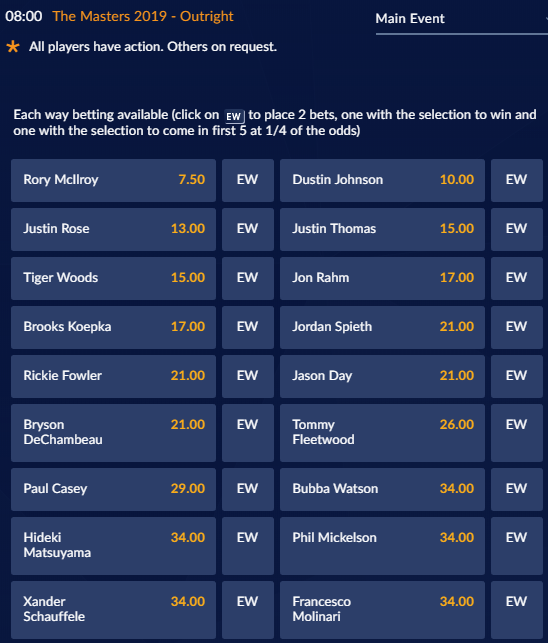 As you can see, Rory McIlroy is currently the favourite to win the tournament at Sports Interaction, with Dustin Johnson, Justin Rose, Justin Thomas and Tiger Woods all right there with 14/1 or shorter odds. Sports Interaction also has several other bets that you can make on The Masters including Group Betting, which involves you picking the top finishing golfer out of a group of five, and also a wide variety of head to head options. On top of the head to head and group options, Sports Interaction also has several larger groups classified by country, such as the top American or top European in the tournament. You can also wager on top 10 finishes for each player, whether they will make the cut, the round one leader and much more. You can find all of these bets in the SportsInteraction.com sportsbook by clicking on ‘Golf’ -> US Masters. That’s it! You should be ready to bet! Click here to visit SportsInteraction.com.